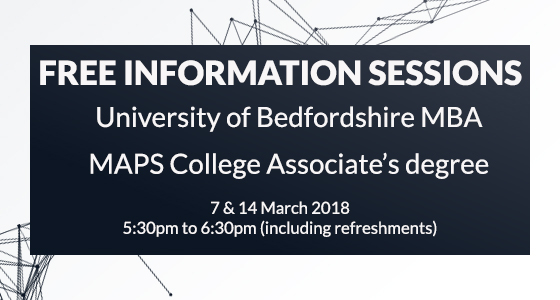 During March, MAPS College is running two free information sessions for two of our most popular international courses – the University of Bedfordshire MBA programmes, and the MAPS College Associate’s degrees in Business Management, Accounting, Human Resource Management, and Marketing, which are dual awarded with the Pearson-Edexcel Higher National Diploma in Business, from the UK. 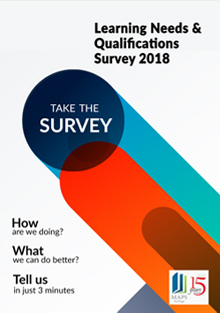 The information sessions are free to attend, and will cover details of the course content, structure, delivery and assessment, eligibility, and more. Attendees will be able to meet and speak to the course lecturers and staff, and hear from existing students about the student experience and what it takes to succeed. The short information sessions will focus on helping potential students find out more about the two specific programmes, to determine whether the programmes are right for each individual. As an added bonus, individuals who sign-up and attend the session will receive a discount on their course fees for each course. Individuals joining the next intake of the Associate’s degree who sign-up and attend will receive a 50% discount from the first month’s tuition fee; whilst individuals joining the next intake of the MBA who sign-up and attend will receive a 15% discount from the first month’s tuition fee. For more information call MAPS College on 331 4621.